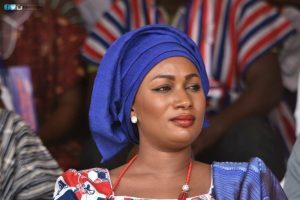 The wife of New Patriotic Party (NPP) running mate, Hajia Samira Bawumia, has accused the ruling National Democratic Congress (NDC) of messing up the economy despite huge oil revenues at its disposal. She added, the NDC has been in power for eight years just the like the previous NPP government but has done nothing significantly to improve the economy , adding that in spite of the availability of oil revenues, the Mahama-led NDC government is putting needless pressure on the economy through excessive borrowing. “The interest alone we are paying on debts is more than the allocation they give to six ministries including education and health. There is still nothing for the NDC to show for the excessive borrowing except for unnecessary expenditure , “she noted. Addressing party faithful at Agbozume in the Ketu South Municipality in Volta Region Wednesday , Mrs Bawumia also debunked claims by some elements within the NDC that the NPP is anti-Muslim. According to her, the NPP is a party that has Muslims at heart and that it is committed to developing Zongos in the country. “The NPP is the first party to have a Muslim as a vice a president in Ghana. They said former President Kufuor wouldn’t have chosen the Late Alhaji Aliu Mahama as Vice President. They also said NPP will drive away Zongo people if voted into power. How can the NPP drive away Zongo people when NPP is Zongo? Politics is not about who is tall or short, but the one who can bring proper development to the people,” she said. Samira Bawumia added that a vote for the NPP is a vote for a fair share of the nation’s wealth, rapid development and prosperity. She advised the people of Agbozume to vote for Nana Akufo- Addo as President on December 7th because he as will use the resources to develop nation.